Astonishing abstract print of multi color kaftan will add a glint in wearer’s look. It has amazing embellishment work of beads and sequins to generate an ember on the beach and resort. •	Finished from fine Polyester material. •	Comfortable and modern call. 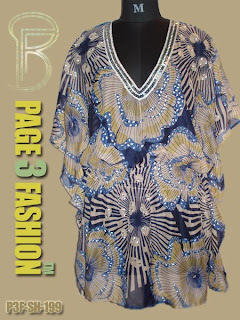 •	Beautiful kaftan for striking any beach and resort.